Could This Be Your Money? Have you ever played the lottery and forgotten where you left your ticket, forgot to check it or you don't even know where your ticket is? There's alot of money waiting to be claimed, it could be yours! 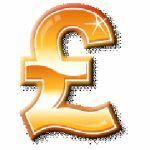 Click on the pound sign to see if you have a windfall! We live in challenging times and the financial aspect is even more challenging for many of us. Forget about the "credit crunch", in fact I can't stand, sit or lay that term, we are going through a global cash crisis - period! What happened in September last year, with the collapse of Lehman Brothers, the stock markets around the world going into freefall and then the domino effect of huge international conglomerates, the real big blue chips, being plunged into the financial abyss of doom, signalled what I interpret as a deconstruction for a reconstruction. What happened last year, I think, was no mistake, I believe the whole thing was engineered, but that's another story for another web page! Now, onto something a little lighter and happier! Have you ever played the National Lottery here in the UK? Well, I'm not a gambler, but recently, I have been playing regulary, just twice a week in fact. Not just because I could do with more money, we all could, but sit comfortably and I'll tell you a little story...! Last year I played the lottery and forgot all about the ticket. By chance, I found it the other day. Although months had passed, it was still valid and to my surprise, I actually won some money! You can guess I didn't win the jackpot, but the point is, is that I had money lying around in my house that I knew nothing about. So, Mr.P being Mr.P, I launched an investigation to see how much money there is floating around in the ethers of The National Lottery. Well, I was shocked to put it mildly. There are millions, MILLIONS of pounds worth of unclaimed prizes, just sitting there waiting to be claimed! Some of the people even hit the jackpot!! I was amazed that in these financially stifling times, people play and don't bother to check or claim [hmmm, yeah right Mr.P]. There is sooooo much cash there, just waiting for a cosy wallet, purse or bank account! If you have played the lottery, there is a chance you have won, no matter how remote you may think it is. So if you have played the lottery and have not checked your ticket, do so as you have up to six months before it becomes invalid and it really "could be you", good luck! DJ Mr.P © TCTK 2009.